UPDATE: Meanwhile I received an "almost" production version (optically final, mechanically nearly final) with a significantly better lens coating. Please find the latest review here. You love to shoot at available light with a wide open aperture, razor sharp details and smooth & creamy bokeh? You like shooting "half" portraits at the classical viewing angle of a 50mm full frame equivalent but you prefer using a mirrorless camera with an APS-C or Micro FourThirds sized sensor? 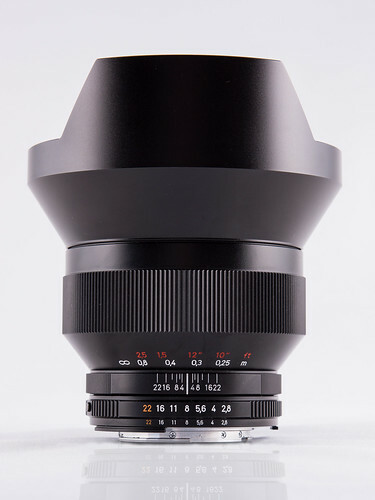 If you say 'yes' and 'yes', then SLR Magic may have a lens making you even more addicted and enthusiastic with their upcoming HyperPrime CINE 35mm T0.95. It is pushing the 35mm limit to a new level. Before we go into detail, let me state that I am not affiliated with SLR Magic. I am just a fan of fast & bright prime lenses and you will see and read my pure personal impressions here. After the launch of their spectacular HyperPrime CINE 50mm T0.95 (see my review here), this small company located in Hong Kong decided to create another lens with a similar design and now they presented their first two prototypes on the "Photokina 2012" exhibition in Cologne, Germany. Andrew Chan, the product manager was so kind to give me the chance to test-drive it a little bit on a Sony NEX-7 beside their other new creations, the CINE 35mm T1.4 and the HyperPrime CINE 23mm T1.7. As SLR Magic is adressing filmmakers as well, these lenses continue the tradition of a stepless aperture ring calibrated in T-stops. Andrew explained, that beside the 35mm T0.95 using a complex 12 element design with extraordinary quality lens elements (some of them are produced by Schott, Germany), they decided to build also a bugdet 35mm T1.4 lens to be availably for a very reasonable price. You can see a short review of the 35mm T1.4 and the 23mm T1.7 here as well. 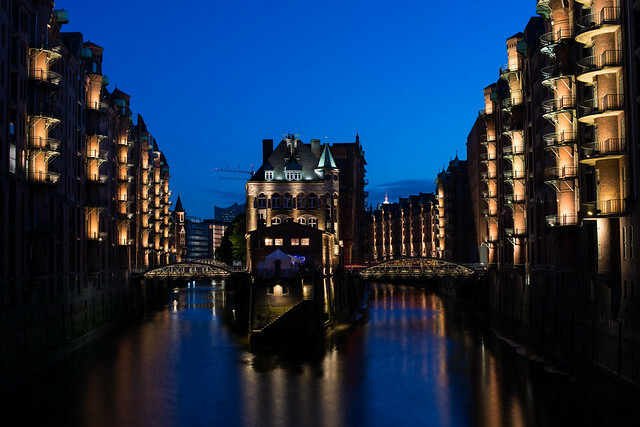 Im Hafenbecken vor der monumentalen Kulisse des Volkswagen Kraftwerks werden mittels modernster LED-, Laser- und Videotechnik die Elemente Feuer und Wasser eindrucksvoll zu italienischer Musik, Kultur und Lebensart in Szene gesetzt. Es handelt sich dabei um Europas größte Wassershow und zugleich die größte transportable Show dieser Art in der Welt - ein Fest für alle Sinne und insbesondere die Hauptshow am Abend (22:00 Uhr) ist unbedingt einen Besuch wert! Weitere Bilder. Klicken Sie hier für die laufenden Veranstaltungen in der Autostadt. Looking for an ultrawide angle lens covering fullformat image circle? We compared the new Carl Zeiss Distagon T* 15 mm f/2.8 with the Samyang 14mm f/2.8 IF ED UMC Aspherical and the Nikon AF-S NIKKOR 14-24 MM F/2.8G ED. With an angle of view of 110° (114° at 14mm), a fast F2.8 aperture and a minimum distance of about 25-28 cm they allow dramatic perspectives for close ups and are suitable for architecture and landscape photography as well. During this review we will compare resolution/contrast, chromatic aberration, distortion, vignetting and bokeh on typical real world examples as in my opinion this is more meaningful than just comparing technical data and charts. 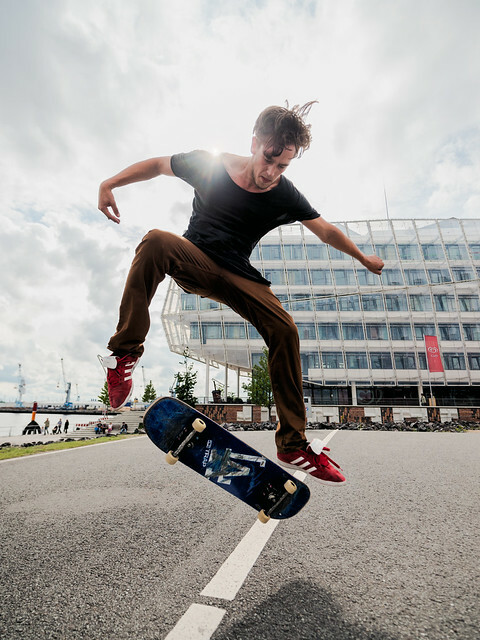 The shots were taken with the "pixel monster" Nikon D800E who's 36 MP sensor currently provides the highest resolution for full frame cameras and with the Sony NEX-7 using an adapter from Novoflex. If you ask yourself "why putting such a lens on the NEX-7 ? 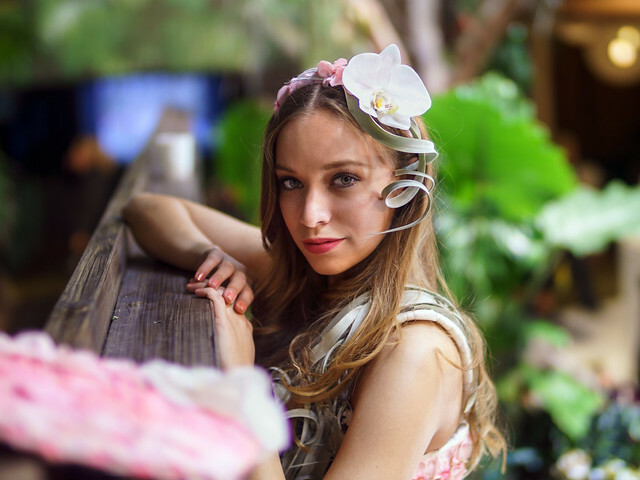 ", her is my motivation: With it's APS-C sized sensor it provides the same crop factor than the D800 in DX mode or a Nikon D7000 but with 24 mega pixels and so it challenges the lenses regarding resolution even more than the D800E (that provides about 15 MP in DX mode). With it's currently unrivaled EVF and 11.7x magnification it is much easier to precisely adjust the focus to it's optimum compared to the D800E's liveview - especially at bright outdoor light conditions. Last but not least, the NEX system still lacks of sharp and fast super wideangle lenses and adapting ultra wide angles designed for Leica M-mount at the NEX-7 usually produces colorshift on the borders. A first review for the Zeiss Distagon T* 2.8/15 you can find already here so let's just sum up the most important technical data before we go into the image comparison. 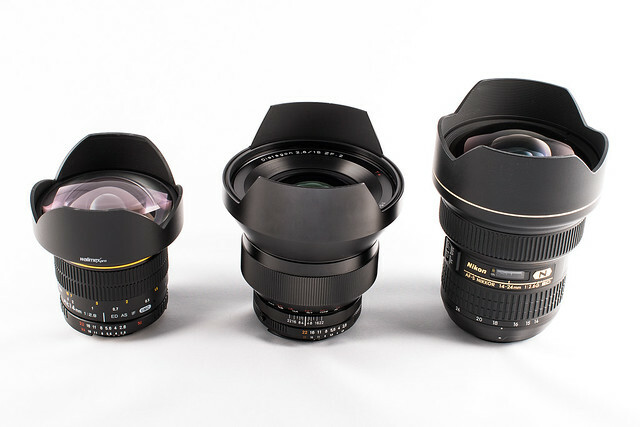 The different sizes are visible above and the weight you will have to carry (with Nikon F-mount) is about proportional to their sizes: ~550g for the 14mm Samyang, ~730g for the 15mm Zeiss and approx. 1000g for the 14-24mm Nikon. All three candidates are equipped with a chip delivering focal length and aperture information to the camera and allowing aperture control also through the camera. 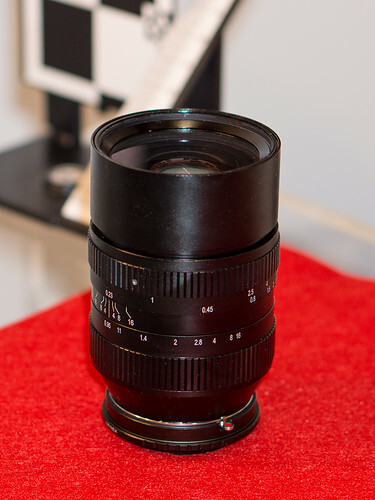 Filters (92mm thread) can only be screwed to the Zeiss. All are of good build quality, the Zeiss provides the best haptic and focus operation and comes with a metal lens hood. The Samyang has the longest focus throw - for my taste too long. You may find the Samyang also in identical construction under different names like Walimex Pro, Rokinon, Vivitar, Bower etc. My sample of the Samyang had a problem with the focus adjustment that is quite often reported by other users as well for that lens: Infinite focus is reached when the focus ring showed about 0.8m on the distance scale. In that aspect my point goes clearly to the Zeiss Distagon. Carl Zeiss Distagon T* 2,8/15 mm - Ultrawide and Fast! Looking for an ultra wide angle lens covering fullformat image circle? Than you should take a closer look to the new Carl Zeiss Distagon T* 2.8/15 mm. With an angle of view of 110°, a fast F2.8 aperture and a minimum distance of 25 cm it allows dramatic perspectives for close ups and is suitable for architecture and landscape photography as well. The manufacturer claims that with 15 elements in 12 groups (including two aspheric lenses and floating elemements design) this lens preserves very natural proportions with minimal distortion, high contrast and exceptional sharpness. So it should harmonize perfectly well even with the latest 36 MP "pixel monsters" like the Nikon D800/D800E. Due to the selection of special glass also chromatic aberrations are nearly invisible and the T* coating is designed to reduce stray light and reflections to a minimum. 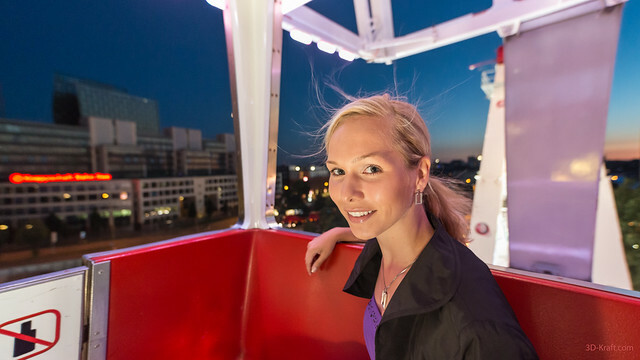 You can read an in depth review and comparison to two other ultra wide angle lenses here. 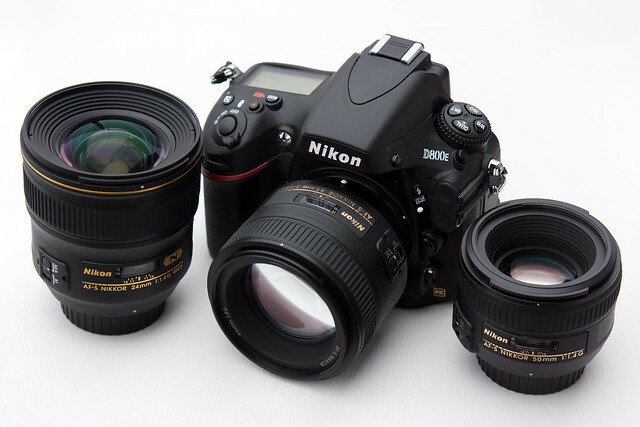 It is available in two versions, one with Nikon F-mount (ZF.2) and one with Canon EF-mount (ZE). Both versions contain a chip that allows the camera to determine the focal length and control the aperture, the ZF.2 version has an additional option to operate the aperture manually. 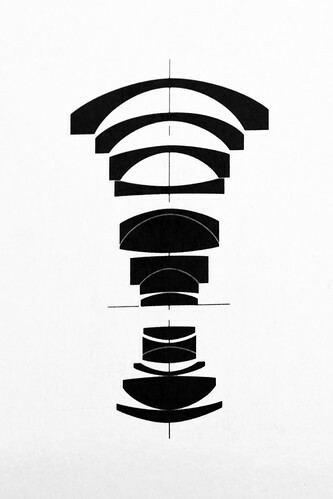 Focus is operated manually with a butter smooth focus ring with clearly defined start and end point, which is interesting for filmmakers as well. 500000 people celebrating in catchy colors the fancy 16th "Schlager Move" in Hamburg. Best viewed in fullscreen-mode. If you can not see the embedded video, please follow this link. Nachdem mich bereits die NEX-7 von der Qualität der aktuellen Sony Sensor-Generation überzeugte, legte nun die mutmaßlich ebenfalls mit einem Sony Sensor bestückte Nikon D800/D800E im Vollformat-Bereich nochmals eine Schippe drauf. Sie erreicht mit 36,3 MP und einem Dynamik-Umfang von 14,4 Blenden (gemäß DxOMark Sensor Scores) bereits Leistungsdaten, die bislang Mittelformat-Kameras mit einem vielfach höheren Preissschild vorbehalten waren. Allein das ist schon Grund genug, sich die D800E genauer anzuschauen. Update: Siehe Ende des Artikels! Nikon liefert sein neues Pixelmonster in zwei Varianten aus. Die D800E unterscheidet sich von der D800 lediglich dadurch, dass ihr Sensor nicht mit einem Tiefpass-(Anti-Aliasing-)Filter bestückt ist. Der Hersteller weist allerdings daraufhin, dass die damit noch erzielte leichte Erhöhung der Pixelschärfe und Lichtempfindlichkeit, unter gewissen Umständen mit der Bildung von Moiré in feinen Texturen einhergehen kann. In der Praxis berichten die bereits mit dieser Kamera beglückten Nutzer allerdings, dass sie bislang selbst mutwillig diesen Effekt kaum herbeiführen konnten. Sofern Moiré doch einmal auftreten sollte, lässt es sich mit einigen darauf spezialisierten Werkzeugen (z.B. ab Lightroom 4 / Adobe Camera Raw 7) mit relativ geringem Aufwand entfernen, wie z.B. dieser Bericht zeigt. Wer also wirklich das Maximum an feinsten Details auch für sehr große Ausdrucke oder stark beschnittene Crops herausholen möchte, der wird vermutlich bereit sein, den Mehrpreis zu investieren. Die nächste Frage, die man sich i.d.R. stellt, nachdem man sich zur Kaufentscheidung durchgerungen hat, ist die Frage nach den "passenden" Objektiven. Eine Kamera mit einem derart anspruchsvollen Sensor stellt die Qualität der verwendeten Linsen auf eine harte Probe. Diese Feststellung machen seit einigen Jahren auch schon die Besitzer von MicroFourThirds- und NEX-Systemkameras, deren aktuelle Sensorgeneration hochgerechnet auf die Fläche eines Vollformat-Sensors bereits mehr als 60 MP auflösen und an denen viele "Altgläser" früherer Analogfilm-Kamerasysteme in mehrfacher Hinsicht nicht mehr den Anforderungen moderner Digital-Sensoren gewachsen sind, wie auch in diesem Beitrag zu sehen ist. Some weeks ago we announced a workshop titled "adorable 50s" that was intended to compare a rich set of bright 50mm primes. Due to the crop of APS-C and (Micro-)FourThirds sensors, these primes convert to typical portrait focal lengths and provide the option to take photos indoor at avalialable light without using a flash and to play with a thin sharpness area. The comparison should allow you to judge sharpness & contrast at open aperture as well as their characteristics how out-of-focus structures in the background are rendered. Here you find the results of the workshop but first a few words about how it was managed: The workshop was held in Hamburg under the direction of Helge Hackbarth together with the lovely model Lara-Dias. It included both an indoor comparison shooting at "avialable light" as well as an outdoor comparison under daylight conditions. A reflector was used in order to establish a good light balance between model and background - no flash at all! The locations were chosen with a versatile background structure in order to be able to assess the rendering of the out-of-focus blur (creaminess, bokeh, etc.) as well as contrast and sharpness of the model in the foreground. Unfortunately three participants dropped out shortly, so that also some exciting lenses that were most welcome alongside the participants were missing (e.g. a Leica Noctilux 50/0.95 ASPH, a Voigtlander Nokton 50/1.1, a Canon 50/1.2 LTM, a Minolta MD Rokkor 50/1.2 and a Jupiter 3 LTM 50/1.5). 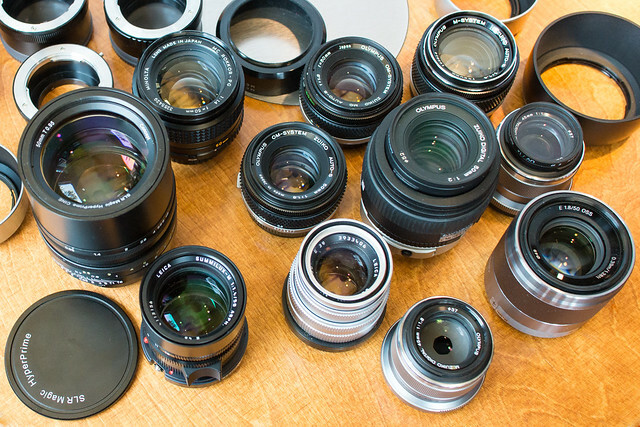 Nevertheless, also the remaining selection gives already a good overview in which such the rather cheap and popular Olympus OM / Minolta MC Rokkor can be compared with upper end priced lenses like the Leica Summilux and a prototype of the SLR Magic HyperPrime 50mm CINE T0.95. 30th April 2012 - When on the medieval "Burgspektakel Bad Bodenteich", witches, elves, trolls and other mythical creatures come together to celebrate the "Walpurgisnacht" (the night before 1st Mai), it's the perfect moment to mount a bright lens like the SLR Magic HyperPrime CINE 50mm T0.95 on your camera. All pictures were taken at open aperture (T0.95 / F0.92).